This is the story of the real life events that inspired Tom Clancy’s “Hunt for Red October”. The only difference is that there is no submarine. A Jew raised in the Soviet Union of the 1960’s had very little to look forward to in the way of career choices. Boris Gindin was an exception. His grades in school along with his mechanical abilities and the intervention of an interested teacher helped secure him a slot at the Naval Academy. From there Mr. Yeltsin embarks upon his naval career landing the coveted position as Chief Engineering Officer aboard the Russian FFG (Guided Missle Frigate) Storozhevoy. The ship’s Zampolit (political officer) has some misgivings about the direction that Russia has taken in respects to the Cold War. The US and Soviet Union were heading toward a thermonuclear confrontation. The crew, composed of mainly young, apolitical men taken from the countryside and conscripted into service, wants no part of it. These misgivings soon boil over into the perceived failures of the Russian Revolution and the Zampolit hatches a plot to take the ship and broadcast his opinions to the world, using the ship as a stage. When the mutiny finally does happen in the harbor at Riga it splits the officers as well as the men- with Mr. Gindin- despite his ill treatment as a Russian Jew- opting to do the duties he was assigned and in a gripping account recalls how the non mutinous officers were herded below and imprisoned along with the Captain. Meantime the Soviet government is rushing to destroy the ship while Mr. Gindin, knowing every inch of the Storozhevoy, is able to escape the confinement and the ship is retaken. in order to capture the real intensity and scope of the mutiny. 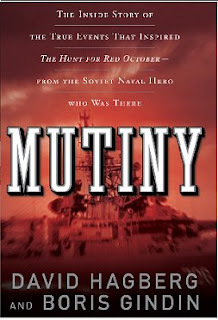 This book will lead you to see the analogies in the 1905 Mutiny aboard the Russian ship Potemkin. The reasons, aims and desires of that crew were the same as the Storozhevoy. But that is the next book….